Offering an absolute ceiling service, our ceiling fixers and installers in Perth can attend to all of your ceiling matters. At A1 Ceilings & Walls, we are the experts in repairing and salvaging ceilings before a total replacement may be necessary. Because of our expertise, we are able to repair ceilings to a standard that other companies cannot get close to. In worst case scenarios where a ceiling may not be able to be repaired, you can rest assured knowing that we are the specialists who can provide replacement ceilings efficiently for minimum cost. Along with our years of experience in providing ceiling repairs and replacements, we also provide a warranty on all of our workmanship. The main reason ceilings may sag is because of their age. How soon this happens depends on the quality of the construction of the ceiling. On average, the age before a repair job is needed is around 5-7 years. The record we’ve seen for a ceiling repair is after just two weeks due to such a poor construction job! A big factor in the price is where the ceilings connect. For example, a small bedroom with cornices all around may be considered to be just the one ceiling, whereas a lounge room ceiling may connect to a hallway, dining room, kitchen and may actually require a little more work. With our expertise, we can often cut the ceiling at the meeting points and patch and paint so that you don’t notice the repairs. Another factor in the cost to replace a ceiling is how soon you get onto it. With time, a sagging ceiling will get much worse. To minimise the cost of the repairs, the quicker we can get to the job the better. Get in touch with us today if you’d like to obtain a quote from our experienced ceiling fixers. 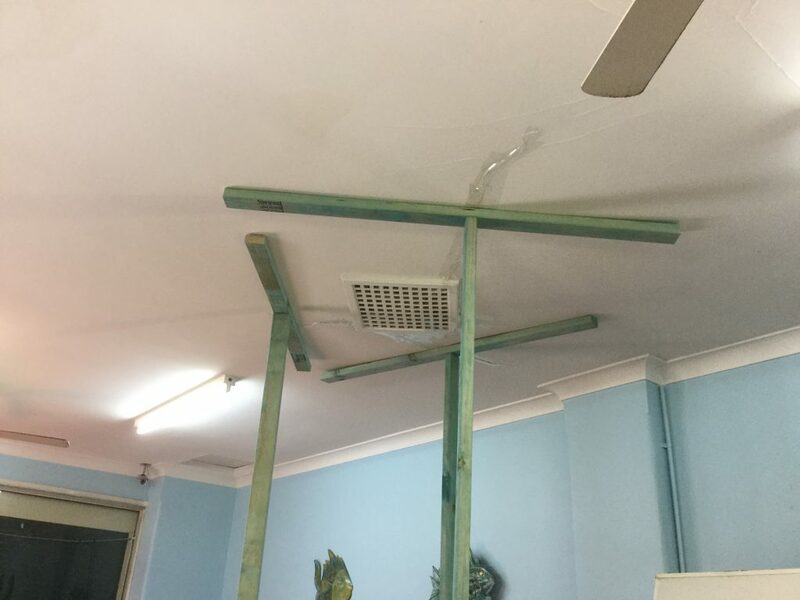 The most common ceiling building method in Australia is to glue and screw materials together (from the mid 1970’s onwards). It’s the failure of the glue that causes the ceiling to sag, which can often happen from the 5-7 year mark. When repairing a modern ceiling, we normally strap them. This is sturdier than re-gluing, as you often can’t get good access to put more glue in there. We have also found that if you just screw it, you tend to have the same problem later, which is why we have found that strapping is the best solution. The sooner the work is done on a sagging ceiling, the repairs will cost less. Minimum cost to repair is from around $500 depending on what is required and the size of the ceiling. If you wait too long to get your ceiling repaired, the cost can be much higher. The main reason for this is because it takes much more time to fix it. The more it sags, the more likely it is to crack and it takes more to fix it and get it like new again. This can cost around $2000 – $5000 for a total replacement, depending on the ceiling size and what is needed. Please speak to our team today about a quote for any sagging ceilings you may have. Some of the contributing factors that can cause a ceiling to become water damaged include storms, leaky solar hot water and any air conditioning leaks there may be. Too much water will damage the ceiling, which can be made obvious by water marks, paint damage, stains and more. A minor job means that sometimes all that is needed is a touch up with some paint, which can cost between $150 – $300. Sometimes we can just cut out and patch a small section that may cost around $250 – $500. With major damages such as storm damage, the ceiling can start sagging, which can then lead to stains, mould, and in some cases, holes. 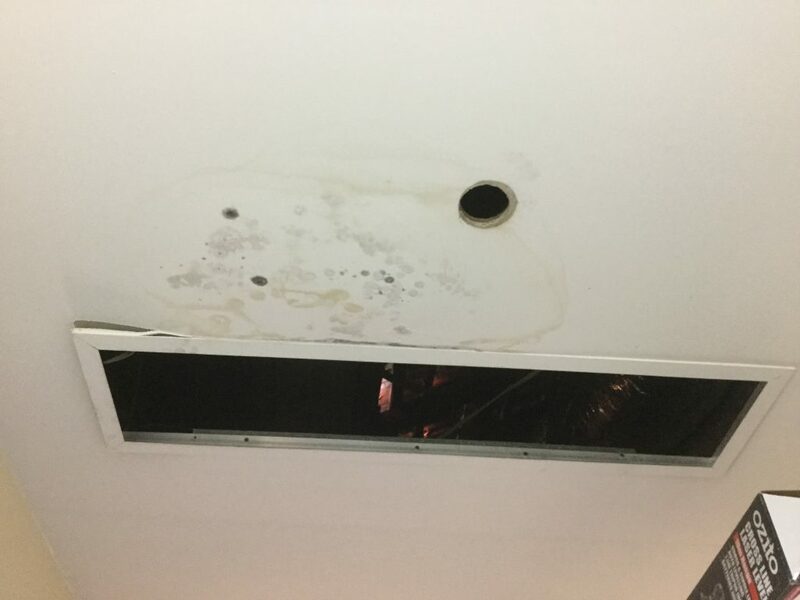 We suggest that the first thing you do when this sort of damage arises is to make a small hole in the ceiling using a screwdriver and drain the water to remove the weight. This should be done as soon as possible. We can normally attend to this within 24-48 hours, where we can replace the entire ceiling for $2000 – $5000. We do both minor and major renovation work where no job is too big or too small. 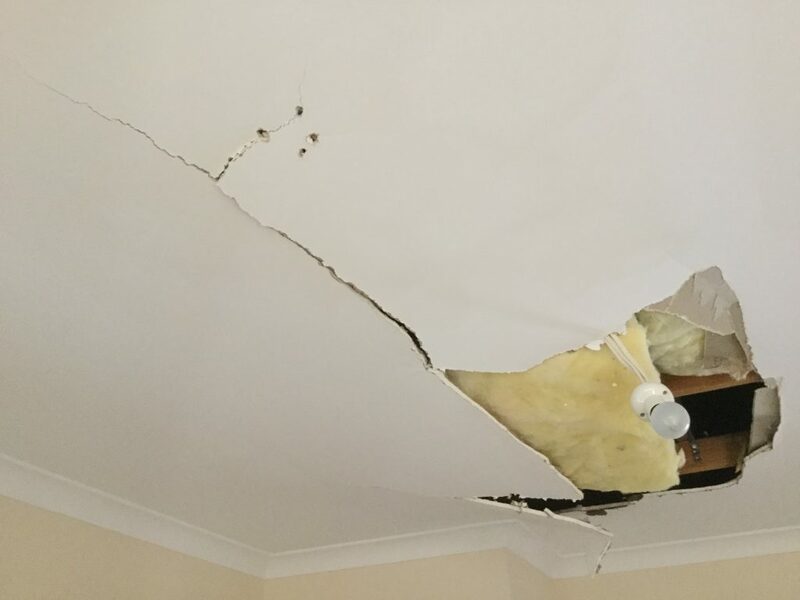 For a quote on how much it costs to replace and repair a ceiling in Perth and Western Australia, contact us at A1 Ceilings & Walls today on 1300 550 406.